You might think that in a place with nearly endless sunshine and light, summer's arrival would be rather unremarkable. 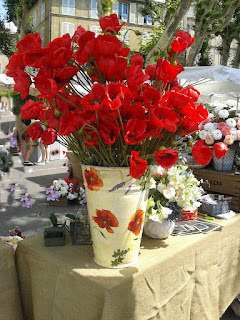 In fact, the rituals associated with the start of l'estival (summer) are quite pronounced here, in the South of France. It seems we spent all weekend welcoming the Provençal sun in its new season. First, to celebrate the summer solstice, we enjoyed la fête de la musique (the celebration of music) on Thursday, June 21. The tradition of free music in the streets until the wee hours of the morning is actually relatively young, 30 years old, but it is widespread throughout France. Aix's fête (party) is well-known in Provence because there are so many stages set up throughout the many squares, so the music-lover has much to choose from, from the French pop, rock, blues, classical, reggae-style, orchestral, and so on. Aix also has more reliable weather (some fêtes were canceled last Thursday due to bad weather in some more northerly French cities). There were thousands of people in Aix on Thursday, more than we've ever seen, and of all ages, walking around listening to all kinds of music, drinking wine or beer, and occasionally the harder stuff. Everyone warned us that the crowd gets a little crazy after 9 pm when the alcohol kicks in among the younger set and that there would be bottles and trash everywhere the next morning. We didn't encounter anything too wild when we turned in after 11 pm, although the pulsating bass beat from the rock venue was audible until after 2 am. Surprisingly, we found the stages largely disassembled and stacked for removal and the streets cleaned when we and the rest of Aix groggily wandered out to school and work the next morning. On Saturday, we headed à la plage (to the beach) to La Couronne to celebrate a family birthday, and for many around us, it was no doubt the first visit to the beach for the summer. Going to the beach is a true rite of summer here, and after some trial runs last summer and twice this spring (one visit to introduce the Med to my sister's family and another with the football team families), we are getting the drill down, especially for the late afternoon/dinner time beach outing. The picnics at any time can be quite elaborate (salads and main courses and of course wine) as is the equipment (special beach blanket, cutlery, maybe even a table, or a sun shade of some sort). 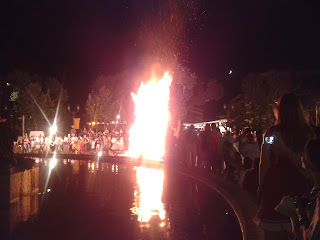 Unexpectedly, I also got my midsummer bonfire on Saturday night after our beach visit, as Aix closed its main street again, this time for Les feux de la St. Jean (St. John's fire). A bonfire in honor of St. John is traditional in Finland on midsummer also, a tradition which I have enjoyed many times, and it appears to be a re-created Provencal tradition as well. The effect was a little different here though, as the bonfire was built just adjacent to the famous Rotonde fountain, on a city street, rather than on a northern lake, and the French pompiers (firefighters) were all ready with their fire hoses uncoiled and fire uniforms on in case the bonfire got out of control and spread to the dry trees and other vegetation nearby. Not only that, the chaleur (heat) from the bonfire was doubly intense because the air itself was already so warm, and the Provençal dancers and musicians in their costumes carefully danced as far away from the heat as they could. And finally, we marked the end of school and the end of sports' seasons this weekend. Because of exam schedules, our boys effectively finished school on Friday, and both boys' sports clubs had grand fêtes (big club-wide parties) today. The football club party that I attended for over 6 hours today (nothing happens quickly here) involved les apéros (appetizers and cocktails), a barbecue with sausages, chicken, tabouli, pasta salad, capped by the big event, the concours de boules (boules competition). 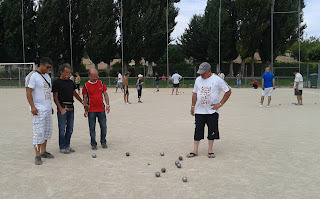 Boules is a very popular summer game here, although I was told that hard-core players play year round. 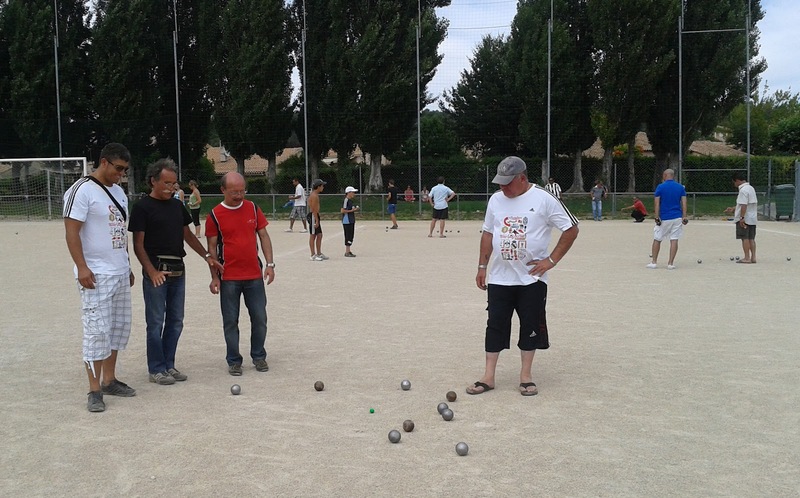 It resembles the Italian bocce ball game and lawn bowling. 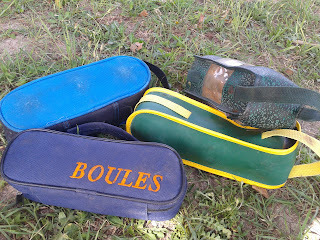 Nearly every family had brought a sacoche boules (a boules bag containing 3 boules each, an assortment pictured here), and there were enough players of all ages that I counted 14 games taking place simultaneously on the gravel soccer pitch with teams of 2 playing against each other, all in the intense sunlight. This game is taken quite seriously; the points were carefully tallied between each set, with careful protocols governing who threw when, and afterwards, everyone shook hands. I never thought welcoming summer could be so demanding or that it would be quite so important here. But, l'été (another word for summer) signifies an extended time of leisure for the French and it does make sense that such a season would be welcomed with great fanfare and rituals, even in places where sunshine is a regular occurrence. We are still trying to get into the French and Provençal seasonal rhythms ourselves, but the rituals we participated in this past weekend, the imminent arrival of summer guests, and a week's vacation in July should help us move right along.